different things…and I think I’m finally okay with that. 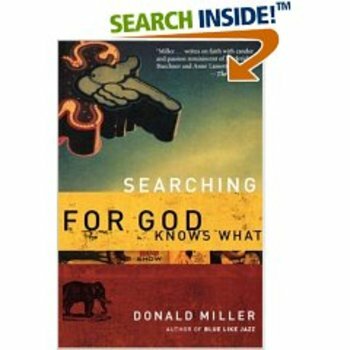 Phil and Emily, a couple of great friends of mine, have started a LifeGroup through my church, and we’re going through the book, Searching for God Knows What, by Donald Miller. Anywho, from what I gather, the general basis of the book is that knowing God is not formulaic, and he’s about to prove it to me-or rather just give me more solid reasons as to why I already think that’s true. Either way, I genuinely look forward to feasting on this guy’s words…and trying to pick up a few writing nuances along the way. guidance, His existence, His mercy and His love. Once I started to read Chpt-1, I couldn’t stop scrolling. He sounds like an interesting writer.